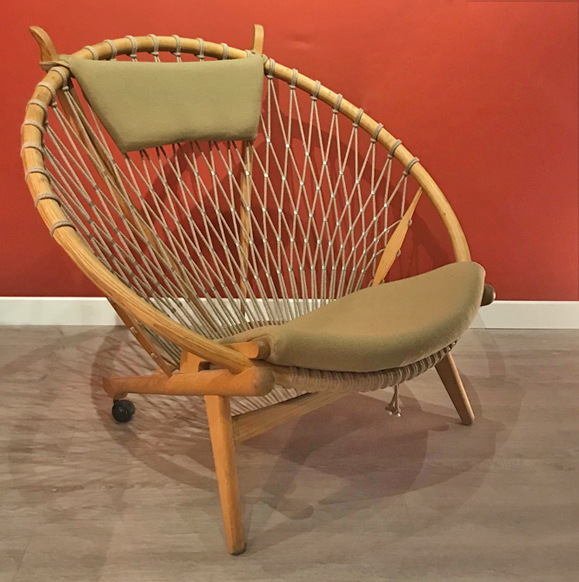 Located in the heart of Serpette for 20 years, this couple of antique dealers shares with visitors their passion for the clean lines and noble woods of the great Scandinavian designers. We invite you to discover this exceptional furniture, in a warm and colorful universe. Katia comes from a family of merchants, since 3 generations. His parents were prints dealers at Marché Biron. She started the business with them in this area. In 1998, she arrived in Serpette and in 2000 settled on her own. She only sold printmaking then evoluted on to drawing and then photography. As for me, I do not come from this univers at all. Living with Katia, and accompanying her on unpacking fairs, I found this magic craft. There was a treasure hunt. I was brought to the Scandinavian furniture in the early 2000's, via Katia's uncle who sold at the Vernaison Market. I trained with him for a short year. In 2003, we took the small booth 23 in Serpette. At that time there was no Scandinavian furniture in this market and we arrived with our leather sofas, chest of drawers and desks. What do you like in Scandinavian furniture ? When I discovered Scandinavian furniture, it immediately liked it and I began to document about the great designers. I like clean lines, quality woods. If we take the time to look under these furnitures, we discover a beautiful assembly. The Scandinavian countries did not suffer the difficulties of the Second World War unlike the French and Italian, which means that at the end of the war they were ahead. I also like the philosophy of the transmission that the great Scandinavian designers have. How do you envision your antique trade ? We quickly saw that in Serpette, there was a high-end connoisseur clientele who allowed us to present high level's objects. We have always tried to keep our identity, but we mix styles. We also exposed some pieces of contemporary artists, we create atmospheres, it is also the combination of our two specialties. We do not know how to make a booth with empty walls. The antique trade is not what it used to be. Customers are much less attached to the designer's name behind a piece of furniture and are more attached to a trend. All the knowledge that we have is not enough any more, it is necessary to give envy and to create stagings. Which piece do you want to highlight ? We have just received a beautiful chair by Hans Wegner, edited by PP Mobler. This is a first edition that was made in 1986. We find all the science of Wegner, the rounded, the work of the rope, the curves ... It is a magnificent work of cabinet making and design. The model is called "The Hoop" because it consists of a big hoop on which nothing is straight. It's very typical of his work. If we look at his pieces of the 50's, we find lines that are never straight, there is always a small rounding. This chair is a rather late work, it is not what we know most of Wegner, but we find all the main lines of his work.